Two days after Big Brown blazed across the finish line, the snapshot of Eight Belles down on the dirt set off a raging debate that extended far beyond the Kentucky Derby: Is horse racing now facing an image crisis? With the memory of Barbaro still fresh, Eight Belles' catastrophic breakdown Saturday put increasing focus on a sport already trying to overcome a decline in popularity. Congressman Ed Whitield of Kentucky, who is trying to toughen regulation of horseracing, told CBS News correspondent Chip Reid that breakdowns are far more common than people think, and are on the rise. Whitfield said that one reason for the rise is that the big money is not in racing horses anymore, it's in breeding them. "These horses really are expendable commodities," Whitfield said. "You want to get the most out of them for a short period of time, and hopefully they are good enough to go into breeding." A prominent animal rights group got involved Sunday, too, criticizing Eight Belles' jockey for whipping the horse and saying the second-place prize should be revoked. But to horse people, it wasn't all that simple. "To make it safer, don't race the horses, don't train them, then they'll live good lives out on the farm," Big Brown trainer Rick Dutrow Jr. said. "But you have to train them for races, you have to run them and that's where the problems start to set in. They have to be asked to run and sometimes in a particular minute, they're asked to run when they're not ready to give it and then it hurts." While Big Brown's bid to become the first Triple Crown winner in 30 years will certainly gain momentum in the next couple of weeks, Eight Belles and the sight of fans crying in the stands remained a focal point Sunday. "Filly's Death Casts Shadow over Kentucky Derby," read The New York Times. "Tragedy mars Kentucky Derby as the only filly dies after race," the Los Angeles Times' Web site said. 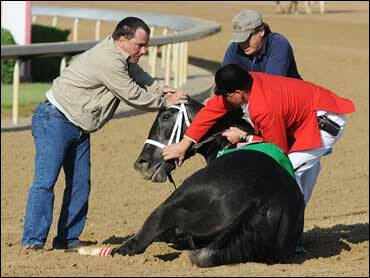 Churchill Downs officials were unsure whether there had been a fatality in the Kentucky Derby. Superintendent Butch Lehr said there hadn't been one in his 41 years at the track. The death of Eight Belles may have been rare because it occurred well after the finish line, but it's just the latest trauma to happen at a major race on national television. Dr. Dean Richardson, the veterinary surgeon who tried valiantly to save Barbaro, told CBS' The Early Show that Eight Belles' injuries were very different from Barbaro's. "It is extraordinarily for a racehorse to break down the way Eight Belles did after the race is finished," Richardson said. Eight Belles suffered fractures of both feet. In the left foot, the fracture was so severe it tore through the skin. "A horse can get around on three legs temporarily. It's impossible for a horse to get around on just its hind legs," Richardson said. Barbaro's demise helped push forward the installation of synthetic surfaces to replace traditional dirt tracks at several tracks, including Keeneland, Santa Anita, Arlington Park, Hollywood Park, Golden Gate Fields, Del Mar, Turfway and Presque Isle. A new on-track injury reporting program seems to indicate the surface is having the desired effect. "This is a very big issue and needs to be discussed," two-time Derby winning trainer Nick Zito said. "You're changing the whole game. Big Brown ran on dirt yesterday, he's going for history. You can't tell me the Polytrack is history. It's not yet, there isn't enough data yet." That's not saying Zito and other horsemen are not interested in making racetracks safer for both horses and jockeys. "If you told me, `Look, we have a device that these horses can run on pillows and never get hurt the rest of lives,' I'd say, `Where do I sign?"' Zito said. "There's injuries on the Polytrack, too. Now you see why I'm saying it's a big issue." People for the Ethical Treatment of Animals (PETA) issued a statement Sunday calling for the suspension of Eight Belles jockey Gabriel Saez. The group also asked for the "revocation of the second place prize." "What we really want to know, did he feel anything along the way?" PETA spokeswoman Kathy Guillermo said. "If he didn't then we can probably blame the fact that they're allowed to whip the horses mercilessly." A call to the jockeys' room at Delaware Park, where Saez raced on Sunday, went unanswered. Eight Belles trainer Larry Jones disputed any suggestion that his horse had no business taking on the boys. "It wasn't that, it wasn't the distance, it wasn't a big bumping match for her, she never got touched," he said. "She passed all those questions ... with flying colors. The race was over, all we had to do was pull up, come back and be happy. It just didn't happen." On Sunday morning, Jones stood next to his Kentucky Oaks-winning filly, Proud Spell, receiving condolences from friends and fellow trainers. "Got here at 5 a.m.," Jones said. "Got to go on. It's hard, but it's what we do." Just then, Barbaro's trainer Michael Matz drove past Jones' barn stopped his car and rolled down the window. On Friday, Matz watched another one of his horses, Chelokee, suffer a life-threatening injury in the Alysheba Stakes. He had just returned from Lexington, where the horse was set for surgery Monday to fuse his injured ankle. "I know you know what it's like, thank you," Jones said. "How's yours doin'?" "Doing good, they're going to operate tomorrow," Matz said. Dutrow was still basking in Big Brown's victory, well aware that an injury can strike at any time. "No matter what happens, you're always going to see horses break down on the track," he said. "That is part of this game. It's a very sad part of the game, but you have to go through it. "For people coming out to the track and seeing that, it's got to make them think, `Man, why would I want to go out there and see that happen to a horse?"' he said. "It's got to be very disappointing to anyone who loves horses."